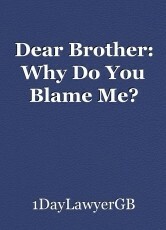 Dear Brother: Why Do You Blame Me? writing a letter to her brother. Is she right to think the way she does? Why does her brother blame her? I write you this letter in hope to establish a more understanding connection between us. I understand that you blame me for some of the events that have occurred in our lives. I want you to get this straight about me, if I joke around, it’s because I try to hide who I really am in fear of how people may react. Whenever I talked to our mom, all she ever said when hearing me was that sometimes I scared her because of the way I thought. Maybe because I said that I wasn’t afraid to die. If I ever said that, it is because I believe that I should never be afraid of the death that awaits me, otherwise I would never be able to reach my true potential and take risks that I’d be too afraid to do if I were afraid of death. I’ll die someday anyway so instead of fearing the day it comes, why shouldn’t I live my life to the fullest. I guess it makes sense that she would worry though because after all, she is our mother and most mothers wouldn’t wish upon death on their children. Many consider me to be intelligent, and stupid according to you, and I appreciate being called stupid because to me, it would be better to be stupid than smart. Why, you may ask? It is because of the story of Adam and Eve in the bible, which I know you don’t believe in, but know that I do because it speaks the truth. God punished Eve with mortality after eating the fruit of knowledge and understanding that she was living a strange life. What if we weren’t smart? What if we never understood? What if we never knew what we felt inside because of how dumb we would be to ever understand? I think it would be better because even when treated wrongly, we wouldn’t even know that we were being treated wrongly. We’d be too dumb to ever understand that we were treated wrongly. What if people start feeling sorry for you because of how “dumb” you are? You wouldn’t even know that they would be feeling sorry for you because you wouldn’t understand even if you did feel something. True, it may seem inhumane to never know what you are feeling or understand what you ever did wrong but if you’re not so smart, you could easily be convinced that what you’re doing is wrong. Heck, you wouldn’t even be able to tell what the difference is between what’s wrong and what’s right. If I say this, and you think it’s strange that I brought up this topic, it’s because I want to remind you of what I am. To be more precise; I am a human. I’m not strong at will although I struggle every day to try to be. I do whatever I can to make things feel right but then again, who am I to say what’s wrong and what’s right? After all, people only think they know what’s wrong and what’s right because they were taught that certain things were right and certain things were wrong in their own way. Because I am human, I want to remind you what a human feels. A human can be sad, happy, angry, and have many other emotions. What I truly mean to bring up are the problems that everyone faces in life and the emotions that come with them. A person can be seen as strong or as weak but either way, a single person can only bare so much that they can’t take in everything. One person may be able to bare more pressure than another and that is because the other person has reached their limit. Everyone has a limit to how much they can take brother. I sometimes get frustrated when you tell somebody that they have it easy and all because others have thought the same thing. I hate to think that you guys really believe that’s true. NOBODY HAS IT EASY! THERE IS ONLY SO MUCH THAT A PERSON CAN TAKE! Nobody would be strong enough to take in all the hate, sadness, and despair in the world; at least not alone. I need to remind you that just like everyone else, I too can only bare so much, especially when my sadness, hate, and despair is caused by the people I adore most in the world; my reasons for living, my only purpose. I’d do anything for those people. I could care less about what anybody thinks of me unless the ones judging me are the only ones I care for and the people I live for; the ones I’d give my very life for. I’ve dug so deep into thought that I have come to believe that the only thing keeping me in this cruel world are all the people I care for. Even with all that in my mind, I am still a mere human being and I have reached my limit. I cannot shoulder all the blame that has been thrown at me by the ones I love most in the world because I am not strong enough. I try to prevent getting taken over by all the blame and sorrow that has been brought amongst me by simply reminding myself that I am not responsible for the choices that others tend to make. I could indeed say something that can make another event occur but the thing is that in reality I would not be responsible unless I forced the event to occur. You blamed me for what our mother did, and for what our older brother did. I can’t take it all in because I’m not strong enough. The thing that bothers me is that I had no control over the actions that they had decided to take and yet I am blamed for what happens. It’s as though my shoulders are so heavy that I could collapse onto the ground. The blame isn’t the only thing I must withstand, I have other problems of my own, the very choices that I decided to make that I myself regret making. Yes it’s true that I made bad decisions, but I am just a human after all. Of course, mistakes is something that every human makes. You may continue to put the blame on me, but I can’t promise that I’ll never collapse. I’m aware that something that I may have said could have triggered an event that to some was not pleasant, but as I said before, I am not responsible for the actions that others decide to make and will never be in control of them. In my memory, I do not recall ever saying anything to anybody, to purposely, cause you pain. Then again, memory is just a fragment of what you believe happened, of what your brain thinks occurred, and only partially accurate. I may be wrong since memory isn’t accurate and may have triggered past events from my choice of words. Then again, people are liars and you never know who is telling the truth. You say that our brother was told about things and you faced the consequences but how do you know if I was truly the one who spoke out and allowed you to suffer through pain. You’re stubborn, so am I, and that is our common flaw. You can call me stupid, that I wouldn’t care about, but I can’t take in all the blame which I am not fully responsible for. On the day I force events to happen and bring about unpleasantness to many, is the day you can shoulder all the blame on me. If you see that my intentions are not pure, then blame me but be sure whether or not they are without making assumptions. I hate problems, I hate pain, and I hate despair. I’ve only longed for peace but in a world where people lack understanding, sympathy, and honesty, I see that it is not possible. So if my fragment of memory is incorrect, then all that I can do is apologize so with that I say I’m sorry for any pain I have caused with my reckless actions. When I know I’ve done something wrong, then I’ll do whatever I can to atone for what I’ve done. For as long as I’ve known, I’ve let the blame to be pinned on me for the sake of others. I hate to see others in pain but I’ve decided that it’s not my job to make peace with everybody, especially when I’ve done nothing wrong. I’ve been pushed by guilt and driven out of my sanity for so long that I just can’t take it anymore. I will not lie. There are things that I have done that like I said before, I surely regret but since my abilities are limited, there’s not much I can do. I wish you could forgive me if I ever did do something wrong unknowingly. Everyone’s thoughts and personalities differ that it’s hard to predict what their reactions may be on certain things that are said. I was so careless that I didn’t expect for you to be greatly affected for what I may have said. They say some just blame others because they either lack control over that person or simply don’t want to take responsibility for their own mistakes. I wonder though, if it’s indeed true. If certain people are to blame for certain events, then is it their fault that they were raised in a certain way? People tend to gain their personality from past experiences and from people that they know so is it their fault that they had to go through what they did? Is it their fault that fate allowed them to cross paths with certain people? It may be but people’s actions are based upon those two things so are they really to blame for making the decisions that they did? Can anyone truly be responsible for something, or is it all the events that they lived through that brought up another event in their lives? Things that happen are what makes a person the way they are, and that’s why it’s important to be able to sympathize with them and to be able to understand them. How are people supposed to know that a choice they make will lead to disaster or despair if they can’t tell the future? It’s logical that if they could tell the future, then they would certainly choose the path that would lead to less despair to them and possibly to others (depending on the person). People at times can be too rash and may act without thinking of the possible outcomes. In doing so, it can be said that they may have made a bad decision that they will surely regret but again, why should they beat themselves up about it when they didn’t know what was going to happen? No one should be judged or blamed because unless they know the future, they couldn’t have possibly known that one of the actions that they decided to take would lead to a negative outcome. With that said brother, why do you blame me? Do you generally hate me? If so, what did I do to make you feel this way? I’m unsure of the path that I must take because like everyone else, I’m afraid I may make the wrong decision. You may not tell me but either way, all I really wanted to say was I’m sorry. Perhaps nothing that I may do may help you forget about the past but you must allow bygones be bygones. The past has already happened and nothing that we can do at the moment can change that. I’m sorry that you had to go through all that pain and believe me, I understand. Know that we’ve been through it all together, I know what you’ve been through and I do not wish for you to go through that again. Everyone must face reality and live their lives through the mountains and valleys, not only you. You are not alone, we all have troubles that we must face. It saddens me that you would ever feel the need to go through it alone. For that, I apologize. Could you ever learn to forgive me? © Copyright 2019 1DayLawyerGB. All rights reserved. Am I you or are you me? This page was created in 0.3928 seconds.